I am a fan of Duncan Jones. Moon was as close as we’ve got to having Stanley Kubrick back with us and Source Code was a pulsating thriller that had the gloss of a big budget studio release but the intricacies and twists normally only found in low budget independent films. 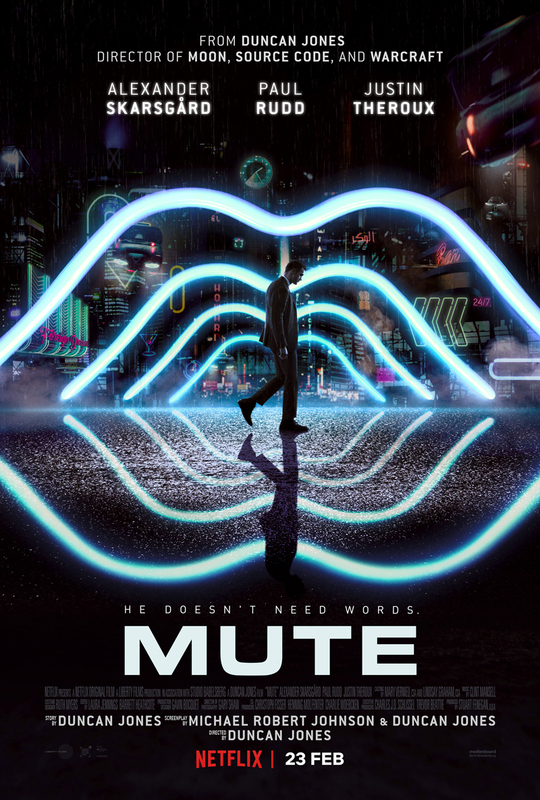 Whilst not a fan of either fantasy or gaming, Jones made me sit through Warcraft and gave me enough that I really quite enjoyed myself, but it was the feel of Moon that I had a hankering for and, when Mute was first mentioned what seems like an age ago, I’ll admit I got very excited. Then it finally came and I hoped my expectations weren’t too high. Exceeded they were, smashed in fact, by a film that Jones himself has stated might be a bit Marmite. I love Marmite and I loved Mute. The question you have to ask of a great story, especially in a science fiction film, is will it work with no frills? 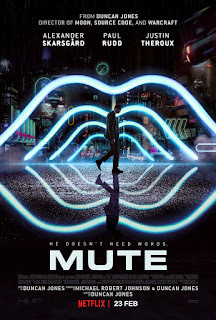 If you take away the flying cars, the neon cyber-punk feel, the robotics, does Mute still work? Yes is the answer. The story is so tight, the characterisations so strong that you could lift it and them and put them anywhere and Mute still works. It’s a brilliant tale with vivid characters that could be in war-torn London circa 1940, it could be in 1960’s America, it could be in the olden days, the fact it’s in a futuristic Blade Runner-esque Berlin is just the icing on a very tasty cake. Alexander Skarsgard will get most of the plaudits and to be fair he carried 95% of his performance in his face, a task that is harder to accomplish than you think. Whilst Skarsgard’s Leo is the glue that holds the entire plot together, and he holds it firmly, there is so much to admire in the rest of the casting choices that I don’t really know where to begin. Paul Rudd as Cactus Bill is so far removed from anything he has ever done before. There are some comedic elements to his portrayal but, unlike his stints on television shows or in his Ant-Man suit, there is more depth to him and so much violence. Even when he’s not torturing someone, or slapping someone, even when he’s just sitting casually in a café, there is a rage inside him that spills out, a hatred almost that is bigger than his glorious moustache. Seyneb Saleh as Naadirah, the reason Leo has to go searching in the first place, is highly watchable and a good foil for the Amish sensibilities of Leo at the start of the film and Robert Sheehan as Luba is as versatile as he is interesting. Gilbert Owuor as club owner/pimp/mob boss Maksim is believable and Rob Kazinsky and Noel Clarke are fantastic little additions that are memorable despite their small amount of time on screen. Which brings me to Justin Theroux as Duck. I honestly cannot remember the last time I was so unnerved, so disgusted and full of hatred towards a character and yet so spellbound I couldn’t stop watching. Theroux’s Duck is a nasty piece of work, a truly despicable character that mixes slimy and paedophilia in equal measure. And yet I couldn’t stop watching him, I could not keep my eyes off Theroux every time he appeared on my screen, I hung on every word he said, despising both him and myself, and yet still hoped he would change or find some redemption. 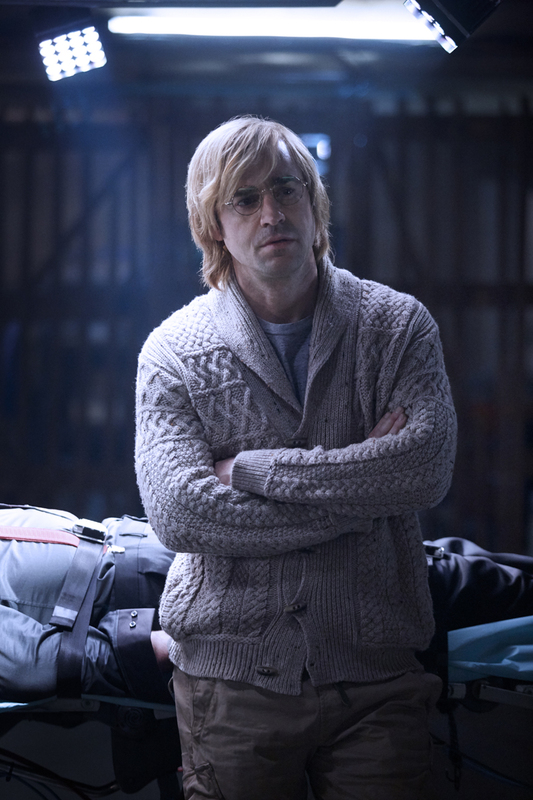 Theroux has always been pretty impressive in stuff and whilst I’ll understand any hatred his performance gets, I genuinely have never been more convinced by any other actor in any other role. You knew Leo was Skarsgard underneath, you knew that under that moustache and foul language there was definitely Paul Rudd. With Duck, I only saw Duck. No Theroux, no actor doing a job, a full on character that was alive and disgusting like I was watching a documentary. If it wasn’t for the subject matter attached to the Duck character then Theroux would be up for every award known to man and would win. Sadly the world, myself included, aren’t ready to celebrate such despicable characters despite how top drawer the performer underneath was. With nice nods to Moon, Sam Rockwell on most television screens in the background, and a Berlin setting that, to me at least, spoke more of a Cold War city in recovery than a neon lit utopia, Jones has aesthetically pleased. With such deep and rich characters he has managed to bring multiple genres together in a simple but effective story that plays out in an imaginative and brutal way. Marmite the film may end up being, but for me it’s possibly the best film I’ve seen in years, it’s certainly I think Jones’ best film, and it’s a story that will stick with me forever. Beautifully crafted art with a side of creepy Theroux... what’s not to like?